This article was originally published 6 November 2018, based on preliminary data presented at the 2018 Society for Neuroscience annual meeting in San Diego, California. We have updated the article following publication of the study 31 December in Nature Neuroscience1. Updates appear below in brackets. A combination of chemical cocktails has created mice that are — yes — virtually invisible. And new imaging technology reveals the mice’s underlying nerves and lymphatic system in unprecedented detail. The reaction when researchers debuted the images today at the 2018 Society for Neuroscience annual meeting in San Diego, California, was nothing short of shock. Even the researchers themselves seemed in awe of their work. The method is the newest iteration of tissue-clearing technology, in which researchers use chemical baths postmortem to render organs or even whole organisms transparent. Looking through the clear layers of tissue, researchers can observe cells tagged with the glow of fluorescent proteins. The new technique, dubbed vDISCO, is a step up from its predecessor, uDISCO, which generated the first images of an intact mouse nervous system. The older technique left traces of bone and tissue that muddied the images. The additional chemicals used in vDISCO remove color from tissue and decalcify bones. Disappearing act: A chemical brew renders mouse tissues see-through, revealing underlying nerves in dazzling detail. vDISCO overcomes another obstacle: Muscle and other tissues emit a natural glow in certain lights, which can outshine the gleam of fluorescent proteins. Ertürk’s team boosted the proteins’ signal by attaching bright fluorescent dyes to miniature antibody fragments, or nanobodies, that bind the proteins. They pushed the nanobodies deep into the mouse tissue with a pressurized pump. The technique boosted the fluorescent signal nearly 120-fold. The signal boost provides a strikingly detailed picture of mouse nerve cells and vasculature. And the signal is permanent: Scientists can revisit their samples years down the road. Ertürk’s team applied the approach to construct a one-of-a-kind comprehensive map of the mouse’s neuronal connections. The images are so detailed that the researchers can follow the path of a particular projection all the way from the spinal cord to the little toe. Long links: vDISCO can trace the path of neuronal projections all through the body. Because the technology allows researchers to study entire biological systems in whole animals, it may illuminate how these systems can go awry. The team tested the technique in a mouse model of traumatic brain injury. They found that the effects of the injury extend far into the body, to where nerves and muscles meet in the torso, for example. 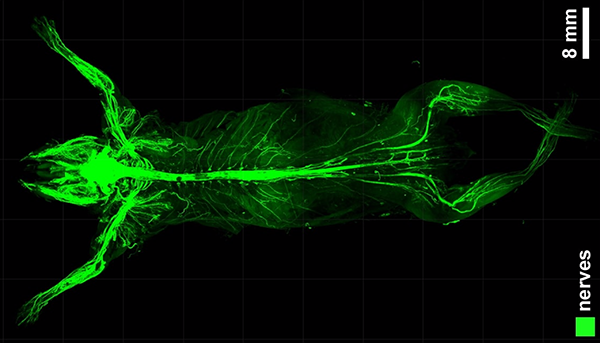 At these junctions, the nerve endings are smaller and less branched in the injured mice than in controls. The researchers also used vDISCO to take a closer look at the vasculature surrounding the brain. They observed vessels that traffic immune cells to the brain, confirming reports that the body’s immune-related lymphatic system extends to the brain2. Some of these lymphatic vessels serve as a passageway between the brain and the skull, the team found. The results hint that the skull plays an active role in the immune system. “To me, it’s exciting to think that skull is really a living part of the brain,” Ertürk says. The technology may shed light on atypical immune functioning in many conditions, including Alzheimer’s disease and autism.